In collaboration with the Ministry of Transport and Infrastructure of the Republic of Kenya, the North­ern Corridor Transit and Transport Coordination Authority (NCTTCA) organized an Investors Confer­ence on the Read Morepromotion and construction of the RSS as part of Transport Infrastructure and services. The conference took place on 28th April 2015, at the KICC Nairobi, Kenya. The Conference was graced and officially opened by His Excellency William Samoei Ruto- the Deputy President of the Republic of Kenya. The conference which was highly attended by Hon. 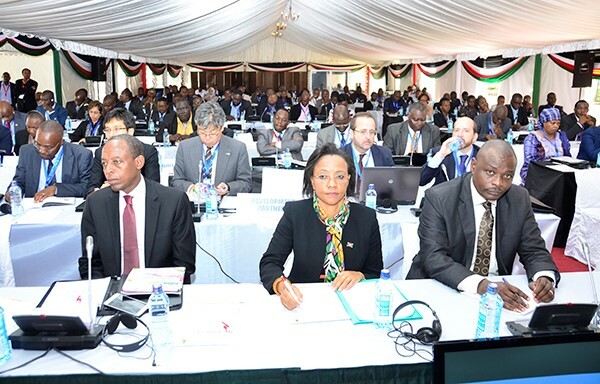 Ministers of Transport and Infrastructure and Ambas­sadors from the NCTTCA Member States of Uganda, Rwanda, DR. Congo, Burundi and South Sudan. The Conference was also attended by Development Partners, Development Banks as well as Regional In­stitutions and NGOs. The Conference drew the Business Community and prospective Private sector Investors from the region in areas of transport and logistics, Energy, Manufac­turing, Trade and Industry. High-level panel discussions were led by Key Note Speakers, Panelists and Discussants from the follow­ing institutions; African Development Bank, East Af­rican Community, TradeMark East Africa (TMEA), JICA, ANAPI, Ken Invest, Kenyan National Treasury and PPP Unit, Kenya National Transport Safety Au­thority (NTSA), Safe Way Right Way, Total, Rwanda High Commission in Kenya. While opening the conference, the Deputy Pres­ident officially unveiled the RSS Model design to be adopted while promoting the development of the Ser­vices. The Kenya Government reiterated its high level support of the program and welcomed prospective In­vestors in the facilities. Cognizance of the fact that the establishment of rest stops will not only provide rest places, restaurants, health facilities to address fatigue and road safety chal­lenges, the Northern Corridor Authority commended the fact that these facilities will also be used as trade centers for the local communities along the highways to sell their produce and art crafts. Indeed, these will be a unique infrastructure that addresses social issues, alleviate poverty and directly benefits local communi­ties along the transport corridors. Develop Roadside Stations as an integral part of Transport Infrastructure Services along the Corridor. Agreed that Institutional Frameworks for spear­heading the implementation of the Project be set up in each of the Member States coordinated by the Min­istry in charge of Transport infrastructure. The Mem­bership to comprise of Ministries of Finance and Treasury ( PPP Unit), Ministries in charge of Land, Ministries in charge of Health, National High Way/ Road Authorities, Agencies in charge of Road Safety, National Investment Agencies. Further agreed that the Coordinating Ministries of Transport in Consultations with the Ministry of Finance will come up with an appropriate financing model and concession mechanisms for implementing these infrastructure services. Secured commitment from Development Part­ners and Regional Financial Institutions to enter into dialogue with prospective private investors in collab­oration with Governments with view of identifying financing windows from Development Banks. Tasked the NCTTCA with overall coordination and steering of the program in all the 6 Member States of the Northern Corridor as well as roll out of the pro­gram to all the Member States. Expressed a sincere vote of thanks to the Govern­ment of Kenya for hosting the conference and the high level political commitment towards working with Pri­vate sector in developing Transport infrastructure and other services through PPPs.